Want to share files on Dropbox but do not know how? This guide will tell you how to make it step by step. 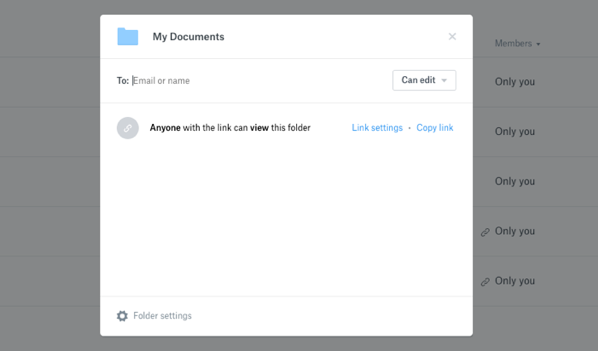 Dropbox lets us store files easily, and at the same time, we can also share Dropbox files to others without effort. However, if you are new to Dropbox, you may feel confused about the steps. To help you out, here we will show you how to share files on Dropbox in 3 methods, from the Dropbox website, from your computer, and from your phone app. Let’s get it on. Step 1 Go to dropbox.com > Sign in with your account. Step 2 Click Files > Find the file/folder you want to share > Hover the file/folder and click the Share button. Step 3 Then you can choose to share the file/folder to a specific person, or create a share link as per your needs. If you have Dropbox desktop app on your Mac or PC, you can simply share your files from your computer, here are the steps. On Windows PC: choose Share > Create link. On Mac/Linux: select Copy Dropbox Link. Step 2 The link will be copied to your clipboard. Now you can send the link to your friends, or share it via social media platform. If you want to share files on Dropbox on your phone or tablet, follow the steps below. Step 1 Go to Dropbox app > Find the file/folder you need. On Android device: tap the download arrow next to the file name. On iOS device: tap “…” next to the file name. Step 2 Choose Share > Tap Create a link. Step 3 Share the link to your friends via email, messages or social media platform. That’s all about how to share files on Dropbox. Hope it can help you. If you like this guide, please share it to help more people.